Did you know the Indiana State Library has over 130 archived webinars that you can access at any time? Earn LEUs on your own time, in the comfort of your own library! 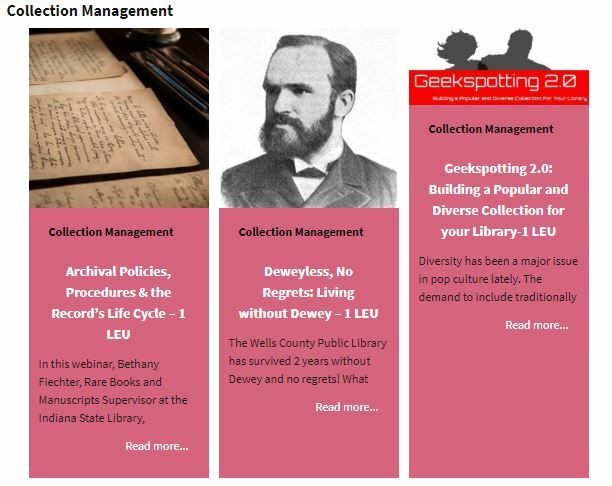 Archived training videos cover a wide range of topics including: admin/management, collection management, director training, facilities/security, genealogy, intellectual freedom, leadership, marketing, populations, programming, reference/research, staff development, trends, youth services and TLEUs. There’s something for everyone! LEUs are awarded hour-for-hour for eligible sessions lasting longer than 30 minutes. LEUs round up to two after 90 minutes. LEUs round up to three after 2.5 hours and so forth. If you have any questions about archived webinar recordings, contact your regional coordinator! 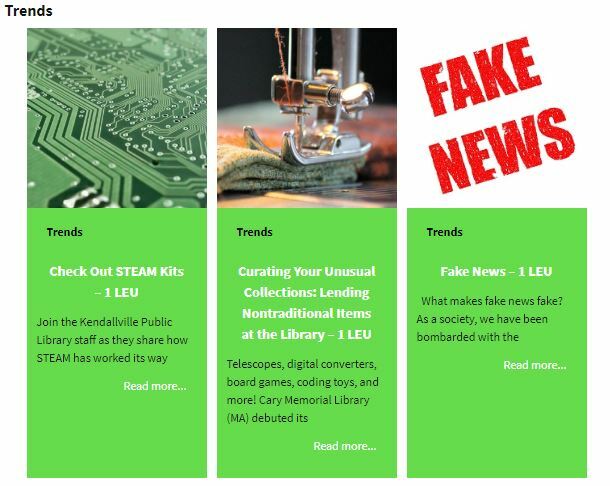 This blog post was written by Courtney Brown, Southeast regional coordinator from the Indiana State Library’s Professional Development Office. For more information, email Courtney. This entry was posted in Professional Development Office (PDO) and tagged Education, Indiana, LEU, LEUs, state library, Training, webianrs by indianastatelibrary. Bookmark the permalink.